Is The Jaguar XE SV Project 8 Way More Powerful Than Advertised? Jaguar claims the super sedan has 592 horsepower under the hood. The Jaguar XE SV Project 8 is an insanely powerful super sedan . Under the hood is a supercharged 5.0-liter supercharged V8 tuned to deliver a monumental 592 horsepower and 516 lb-ft of torque according to the official figures provided by Jaguar. However, it turns out the automaker may have been conservative about the Project 8’s performance prowess. Car collector Harry Metcalfe recently rigged his Project 8 to a dyno to find out how much power the car really produces, and the results were surprising. The car performed very well, delivering 601 hp and 506 lb-ft of torque at the crank, making it more powerful than advertised. No wonder the . 0-62 mph in the super sedan takes 3.3 seconds before it tops out at over 200 mph. 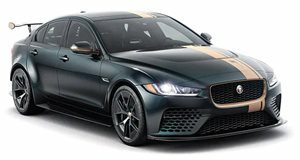 To achieve such blistering performance, Jaguar Special Vehicle Operations added a host of weight-saving upgrades including carbon fiber front and rear bumpers and a vented hood. An assortment of aerodynamic components also give the car an aggressive look such as an adjustable rear wing and rear diffuser. The car also rides on 20-inch forged alloy wheels and features stiffer suspension, improved steering and throttle response, and ceramic brakes. While the Project 8 has significantly more power on tap than the BMW M3, its $200,000 asking price puts it in an altogether different league.